96-Well Cell Invasion Assay, Collagen I | Cell Biolabs, Inc. The ability of malignant tumor cells to invade normal surrounding tissue contributes in large part to the morbidity and mortality of cancers. Cell invasion requires several distinct cellular functions including adhesion, motility, detachment, and extracellular matrix proteolysis. Our CytoSelect™ 96-Well Cell Invasion Assays utilize precoated inserts to assay the invasive properties of tumor cells. Invasive cells can be quantified in 96-well plates on a fluorescence plate reader. Inserts are precoated on the top of the membrane with Collagen I. 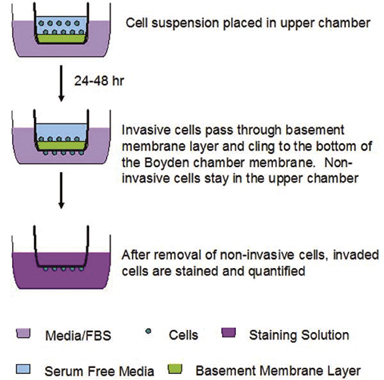 Figure 1: CytoSelect™ Cell Invasion Assay Principle. Cell suspensions are placed on top of the gel matrix inside the upper chamber. After 24-48 hours, invasive cells move through the matrix and adhere to the bottom membrane of the insert. Non-invasive cells are then removed from the upper chamber, and invasive cells can be either stained and counted using a light microscope or quantified after extraction using a colorimetric or fluorometric plate reader. Ben-David, U. et al. (2016). The landscape of chromosomal aberrations in breast cancer mouse models reveals driver-specific routes to tumorigenesis. Nat Commun. doi:10.1038/ncomms12160. Ho, P. W. et al. (2015). Knockdown of PTHR1 in osteosarcoma cells decreases invasion and growth and increases tumor differentiation in vivo. Oncogene. 34:2922-2933. Ishiba, T. e. al. (2014). Periostin Suppression Induces Decorin Secretion Leading to Reduced Breast Cancer Cell Motility and Invasion. Sci Rep. 4:7069. Ziemann, A. et al. (2013). CRN2 Enhances the Invasiveness of Glioblastoma Cells. Neuro Oncology. 10.1093/neuonc/nos388 (#CBA-112-COL). Liu, X. et al. (2013). Antiproliferative, Antiinvasive, and Proapoptotic Activity of Folate Receptor α-Targeted Liposomal Doxorubicin in Nonfunctional Pituitary Adenoma Cells. Endocrinology. 154:1414-1423 (#CBA-112-COL).